Heat oil on med/high heat. Add ginger, garlic, spring onions. Cook for a minute, add chicken. Cook 3 or 4 minutes. Add water chestnuts. In a bowl, mix soy, hoisin, vinegar, cornstarch and 1/4 cup water. 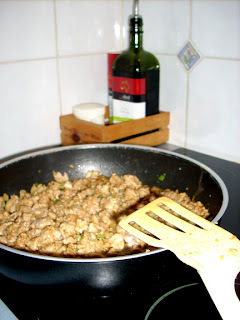 After chicken browns, add mixture to pan. Boil and let thicken. Readuce to low and simmer 1 min. Prepare vermicelli rice noodles according to package directions and add at the end. The ones I buy only require you to pour boiling water over them and let set for 5 minutes. These are not essential to the recipe ! You could even leave them out ! Pull apart lettuce leaves. Put in big bowl and cover with ice water. 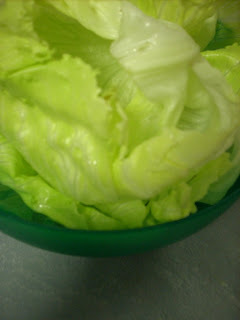 I put out a big bowl with the chicken mixture, and the bowl of lettuce leaves in the ice water. When ready to eat, scoop a small amount of hot chicken mixture into lettuce leaf. YUM ! Thanks for this recipe. This is one of our favorites at P.F.Chang's, where they call them "Soothing Lettuce Wraps." Did you tell us about them or Ellie? Someone told us to order them the first time we went, and we loved them. Can't wait to try the home cooked variety! YES it does look tasty!!! I prefer the beef instead of the chicken though...the first time I had this, was in South Korea, and boy was it delicious!!! Looks yummy! But what the heck is "chicken mince"????? ?